As a life-long educator and learner, I am currently writing a book that provides practical insights and guidance for repairing the cultural disconnections that undermine authentic relationships in the 21st century. This book will help us question the habits of mind and spirit; cultural legacies that lead us to believe the myths that keep us divided from each other across social identities such as race, class, gender, and religion. My goal is to help us transform our legacy narratives of disconnection to new visions that enable us to be exemplars of positive possibility in the world. My friend Maureen Walker is a brilliant, highly skilled facilitator. She and I have spoken and taught together about collaborating across race and about dismantling racism, and I've seen her bring seriousness without shaming, honesty without evasion or intimidation, and immense clarity with connection – to me, a white woman, and to others of all identities. The process of working with her, listening to her, and being heard by her is one of the greatest and most fruitful adventures of my life as a thinking, feeling person. - Christina Robb, Author, This Changes Everything: The Relational Revolution in Psychology (2007), Author of The Anablog (readtheanablog.wordpress.com). 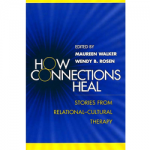 Authors: Wendy B. Rosen, Maureen Walker, Ph.D. This practice-oriented casebook shows how relational-cultural theory (RCT) translates into therapeutic action. The book explains key concepts of RCT and demonstrates their application with diverse individuals, couples, families, and groups, as well as in institutional settings. Emphasizing that relationship is the work of therapy, case narratives illuminate both the therapist and client factors that promote or interfere with movement toward connection. Highlighted are the ways in which cultural contexts profoundly influence relationships; how growthful connection inevitably includes conflict; and how experienced therapists work on a moment-by-moment basis to engage with and counteract personal and cultural forces of disconnection. Part I. 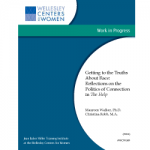 “Getting to the truths about race…and the stories we tell along the way” by Maureen Walker, Ph.D. Although good intentions may be necessary, they are never sufficient to sustain an authentic conversation about race. Because shame and anxiety are endemic to racially stratified cultures, what may start as well-intentioned discourse typically devolves into dread, recrimination, or escapist sentimentality. Using the best-selling novel The Help as a focal point, this paper discusses the critical relational capacities required to facilitate movement toward new relational possibilities. 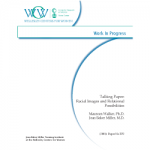 Authors: Maureen Walker, Ph.D., Jean Baker Miller, M.D. This conversation deals with some of the psychological consequences of structured inequities for those socially defined as “more than” as well as those defined as “less than.” Using Relational-Cultural Theory’s concepts, the talk illustrates how racial and other social or economic inequities interfere with the mutual openness to influence, which is the source of growth. The speakers also discuss the interrelationship of “controlling images” and relational images. In this important third volume from the Stone Center at Wellesley College, founding scholars and new voices expand and deepen the Center’s widely embraced psychological theory of connection as the core of human growth and development. The volume presents an absorbing and practical examination of connection and disconnection at both individual and societal levels. Chapters explore how experiences of race, ethnicity, sexual orientation, class, and gender influence relationships, and how people can connect across difference and disagreement. Also discussed are practical implications of the theory for psychotherapy, for the raising of sons, and for workplace and organizational issues. I’m available for interviews and to author articles.